As part of our celebration of Daredevil leading up to the release of the Netflix series this Friday, we present to you an overview of the most recent and current run of the Daredevil comic series, written by Mark Waid with art by Paolo Rivera, Chris Samnee, Marcos Martin, and Javier Rodriguez. This is a series that launched to a lot of fanfare back in 2012 as it rebranded the character with a less depressing tone than previous eras and aimed to bring back the swashbuckling fun into a character that has suffered more cruel twists of fate than anyone in the last ten years. It's also been an extremely consistent run, with only one or two very minor blemishes on an otherwise spotless series. As a newcomer to Daredevil, this series is my bet for most accessible as well, so if you're looking for somewhere to start after watching the Netflix series, look no further! 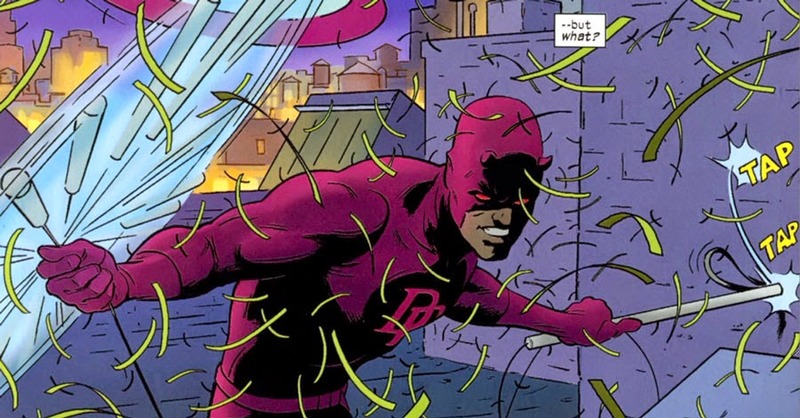 From the opening scene, in which Daredevil interrupts a mob wedding and spontaneously kisses the bride, this series aims to be something different from the dark, somber tone of previous incarnations. 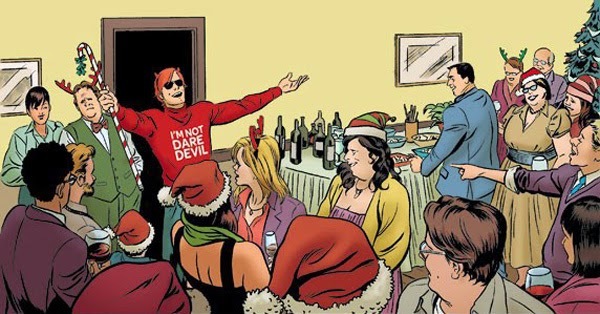 However, it's central conceit takes cues from the fact that Matt Murdock has been outed as Daredevil; the first arc plays with this idea in funny ways and finds Matt forced to find clever ways to continue his law practice. This fun, comedic shift isn't wholly unexplained though, as Matt explains that he has to change his outlook on life and swallow down his deeply troubled past. We are also introduced to Kirsten McDuffie, the new assistant D.A. and Matt's playful new love interest. First Rivera and then Martin give the series a colorful sense of adventure and movement, and although we get the inevitable fight with another superhero by mistake cliche, the action is so fun that it's impossible not to forgive. While the second arc is less focused and lets some of the darkness back in as we delve into Matt's past with his father, it's done in such a strange way that it oddly doesn't come across as grim and gritty. This is where the series begins to make its mark as a series of one or two issue stories that come together to add to the whole, a strategy that made for a very satisfying month-to-month experience, but works just as well collected into a trade paperback. The art is much less consistent here, but the variety isn't all bad, particularly when Emma Rios comes on board for an issue. This arc culminates in a weird but entertaining journey into the world of Mole Man and the Moloids, exploring Matt's dark past while bringing him into new and interesting territory. Volume three sees the entry of Chris Samnee, who would continue to draw the series even through it's relaunch some twenty-five issues later. Samnee is an absolute master of his craft, and although Rivera and Martin were the perfect artists to launch the series, Samnee is clearly the partner that Waid was waiting for, and he plays a huge role in the storytelling and pace of every issue from this point on. While this arc is largely taken up by a crossover event, which has spelled doom for many great series, it actually is quite fun. Spider-Man and The Punisher are thrust into the story as the trio must protect the Omega Drive that contains information that every villainous organization in the Marvel U wants to get their hands on. Additionally, this arc has a terrifying and thrilling short story in which Daredevil is being held in Latveria and has lost all of his senses, and brilliantly portrayed by Samnee. While the fourth arc is notable for having a phenomenally fun issue illustrated by Mike Allred, the fourth and fifth volumes blur together as they build up to the main thrust of the series as Matt seems to be losing his mind. Is it a product of his attempts to put on a cheery exterior despite his less than rosy past, or is someone manipulating things behind the scenes? 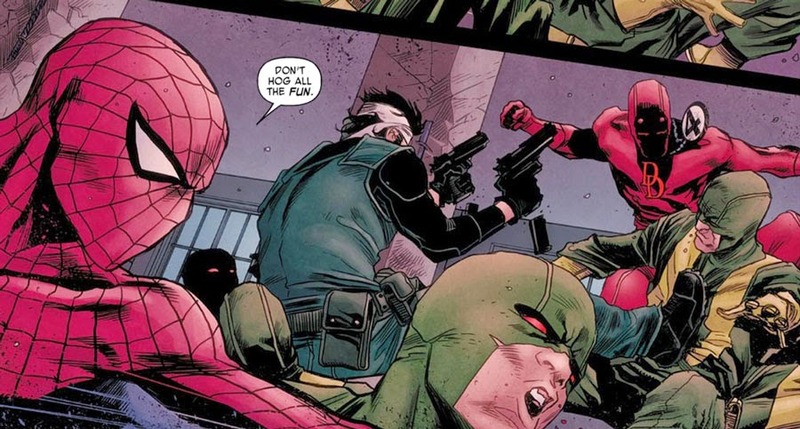 While the reveal is less than a huge surprise, it has a lot of impact, and the new villains created along the way have left future Daredevil scribes lots of new toys to play with. Ikari, a man given Daredevil's powers but with the advantage of sight, is particularly interesting and well designed–I hope to see him crop up again sometime. The last two volumes of the original Waid run find Matt returning to law and uncovering a conspiracy involving the Sons of Serpents that runs deep. While there are some fantastic bits here, this is definitely the low point of the series; it's consistently a fun read, but the themes are far more heavy-handed than in previous arcs. Although it made for a fun Halloween theme, the last volume's jaunt into literal monster territory is a bit too on the nose. Given the rather forced relaunch, though, Waid and Samnee manage to find an interesting corner to force Daredevil into and a sufficiently fun way out that provides an impetus for the cast's move to San Francisco. Overall, the series was a highlight of Marvel's line up at the time–the new volume still is, to a slightly lesser degree. It brought a level of swashbuckling adventure to the character that couldn't be found in any other superhero books, although a connection could be made to Fraction's runaway Hawkeye run. The fact that while it was building in some ways to a climactic villain reveal, but never seemed to be writing for the trade, made it a reliably top-of-the-stack book from month to month, and reading them all at once instantly recalls that exciting feeling. The current series which follows Matt, Kirsten, and Foggy in San Francisco is still almost as good, so you can always start picking up there and be fine, but I highly recommend fans of the more acrobatic and high-adventure aspects of the character pick up the first volume. It's a classic start to a great series, and if for nothing else, check it out to see the beginnings of one of the great modern creative teams in Waid and Samnee. I can't say if the show will latch onto this sort of tone or will follow in the footsteps of some of the old greats, but suffice to say this run is one that made an unquestionable mark on the character and is a great starting point for anyone looking to break in!